Politics and history have always been entwined, but in recent years their entanglement seems to have reached a climax. Politicians all over the world are turning to the past to legitimize their authority in the present. Trump promises to ‘Make America Great Again’ by reaching back to a moment in time when American values were still pure. The Brexit campaign appeals to an idealized past in which the British Empire still had the upper hand in world politics, as if history had been standing still ever since. And in his first address to the Russian parliament, Putin described himself as the incarnation of the ancient lord Vladimir of Kiev – implicitly claiming that the lands of Russia, Belarus and Ukraine are historically bound together. These are all examples of what Christopher Clark refers to as chronopolitics: the relation of time-perspectives to political decision-making. Although the term has been around since the 1970s, chronopolitics has recently made a comeback due to the ‘temporal turn’ in historical studies. It implies that time and history are no longer to be treated as neutral, universal substances; instead, they should be seen as cultural and political constructs. Following the work of Reinhart Koselleck, François Hartog and Peter Fritzsche, Clark aims to show how assumptions about the way in which the past, the present and the future are connected implicitly shape the arguments deployed to justify political actions. He does this by delving into the political history of Prussia and Germany from the seventeenth to the twentieth century – a period previously covered in his international bestsellers The Sleepwalkers and Iron Kingdom. Time and Power focuses on four particular moments or persons in German history: Frederick William, the ‘Great Elector’, who had to deal with the aftermath of the Thirty Years’ War; Frederick II, the enlightened sovereign who was himself a historian and wrote several historical treatises; Otto von Bismarck, who tried to rule in times of revolutionary upheaval; and the Nazi regime, which sought to distance itself from the disastrous Weimar years. Each of these moments, Clark shows, had its own distinctive way of looking at history and the nature of change over time. When Frederick William became Elector of Brandenburg and Duke of Prussia in 1640, Germany was still a patchwork of war-ravaged territories and estates that were oriented towards past traditions. In order to liberate the estates from the authority of the past, the Great Elector employed a language of ‘emergency’ in which he warned against future conflicts and wars. By articulating these future dangers, the Elector was able to centralize power and take control over the German territories. Clark’s research on the Great Elector’s chronopolitics is a great contribution to the field of temporal history, which so far has consisted mostly of theoretical explorations. Clark succeeds in making these theories tangible through an extensive case study which he uses to show how a shift in temporal awareness underlies the establishment of political authority. The chapters on king Frederick II and Otto von Bismarck, however, are less convincing and seem a bit unbalanced. When it comes to Frederick II, the Elector’s grandson, Clark applies a more psychological approach, arguing that Frederick’s traumatic childhood and youth lie at the heart of his view of history. Even if this were the case, Clark fails to show how this trauma influenced the king’s political decision-making. In the case of Bismarck, the focus seems to be more on the ‘timing’ of political actions in a period of revolutionary upheaval, and not on broader conceptions of history, making it harder to discern the relation between this chapter and the ones preceding it. Only when he arrives at the National Socialists, Clark seems to regain his feet. He shows with great insight how the Nazi’s painted a picture of an ‘Eternal German’ identity that allowed their most radical political aspirations to become reality. Clark concludes that there may be a relationship between trauma and temporality. The Elector had to deal with the aftermath of the Thirty Years’ War, Frederick II had a childhood trauma, Bismarck wanted to move away from the chaos of the 1848 revolutions, and the Nazis gave the Germans something to believe in after the devastations of World War I. When people are confronted with sudden disruptions in power structures, they flee from the miserable present into a desirable future or an idealized past as a form of therapy. Throughout the book, Clark keeps lamenting a ‘loss of future’ in our own present. In the United States, Poland, Hungary and other countries, populists are fabricating new pasts to displace old futures. Especially in Europe, which has been traumatized by the Greek financial crisis of 2009, the Ukraine crisis of 2013, and the European migrant crisis of 2015-2017, nationalist and populist movements are offering ‘a range of visions whose common theme is an appeal to an idealized past’. The European Union can no longer offer the best hope of confronting these issues, and therefore Clark fears the return of nationalist sentiments and identity politics. 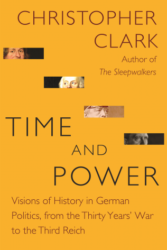 Although Clark does not provide any solutions to this ‘loss of future’, Time and Power does show that, in history, periods oriented towards the future have always been succeeded by periods focusing on the past. The Great Elector’s future politics were replaced by Frederick II’s love for Roman emperors and their ‘timeless’ values; and the modernizing, progress-driven ideals of the nineteenth century eventually fueled the Nazis’ love for stasis and eternal ideals. Herein lies the main contribution of Time and Power: it aims to break with the ingrained belief, put forward by Koselleck, that in the sixteenth century cyclical conceptions of time were eclipsed by a linear view of time which detached itself from the past and aimed towards the future. Clark shows that these cyclical conceptions were (and are) not something of the past. They continued and continue to attract people who believe that the past can be forced back upon the present.